Those who love to play in the kitchen–whether cooking or baking–are usually fairly flexible. If we run into snags (and maybe it’s just me, but I run into plenty), we either toss out what we’ve done and begin again OR take a different path and see where it goes. I’m almost always in the second camp as I hate tossing something I’ve already spent time on. Take a recent project: frosting my oldest daughter’s birthday cupcakes. Her party is this weekend and I’ve been making and freezing cupcakes for weeks. Now that the party is days away, it’s time to think about frosting. My original plan was to make three: white, chocolate, and caramel. I found fun recipes (check out Baked Explorations–lots of crazy-good recipes, all very do-able) and the chocolate frosting went off without a hitch. The caramel came next and involved stirring homemade caramel sauce into a white buttercream. I made the mistake of stepping away from the caramel (oops) and returned just in time (so I thought) to take the pan off the heat. But the temp had crept just past 300°F and my “caramel” crystallized as I stirred in the cream and butter. I tried to melt it down over low heat, but you can’t change the laws of chemistry. No go. Not willing to give up, I knew the buttery cream that wasn’t melding with the overheated sugar mixture would add great richness to any frosting; I stirred some into the whipped butter base that was waiting for the caramel sauce. I added extra powdered sugar for thickness and chopped the hardened caramel (almost brittle, really) into very small pieces and mixed those into the final frosting for crunch. 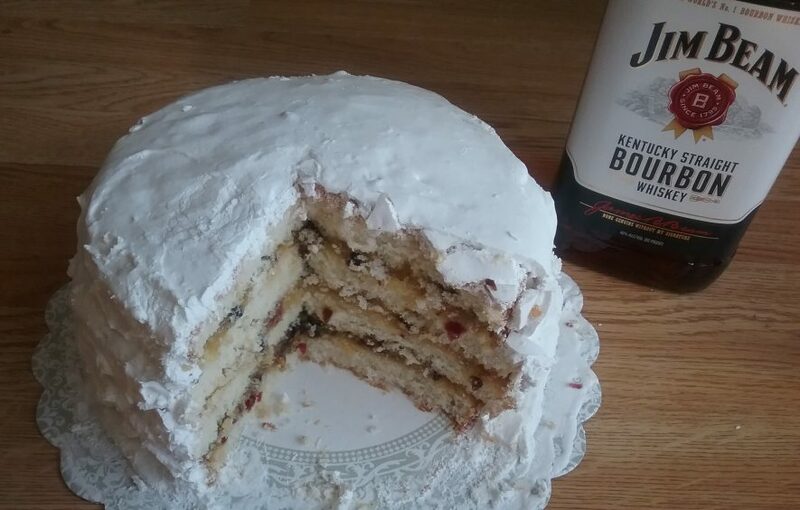 It took a few more tweaks with brown sugar, vanilla, and salt, but I got to a place I liked. After all the extra ingredients, I had plenty of caramel frosting. No need to make a third flavor. I was done. With a cup or so of chocolate frosting and maybe three times as much of the light-brown caramel, I started thinking kitty cats. The birthday girl had included our orange tabby’s picture on her party invites. 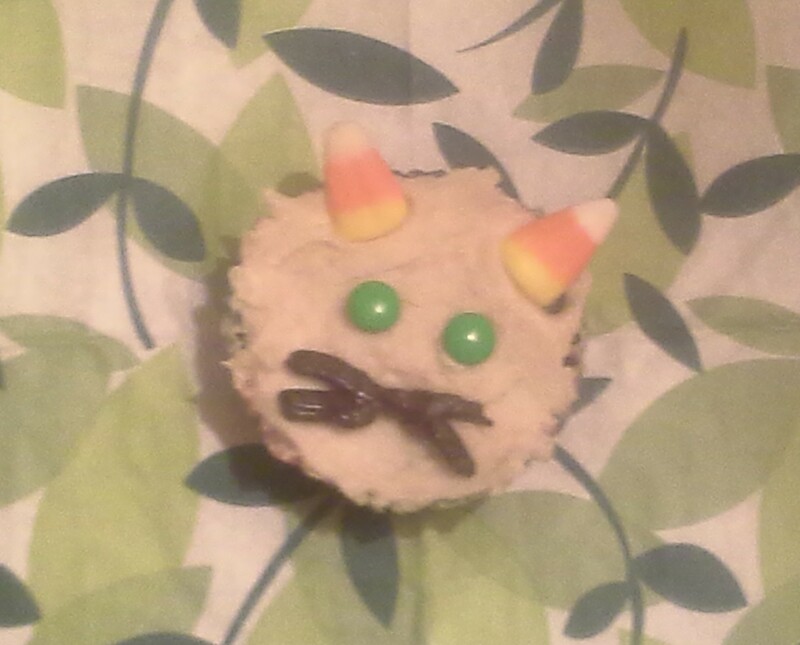 Why not turn these cupcakes into cat faces? I’m not much for putzy cake decor, so wanted to keep it simple and use what we already had. A few mini m&ms and candy corns later, I had a cute–if slightly demented–kitty cat staring back at me. Believe it or not, these are the same cupcakes from bacon birthday cupcake post. Not as pretty, but better suited for a 10-year-old’s birthday party. I get that this cupcake looks terribly homespun. I have no future as a Cupcake Wars contestant for sure. My “cat” looks childishly simple, sad, and slightly devil-ish. But our party guests will get that these cupcakes are supposed to look like cats. And these guests will absolutely enjoy the cupcakes’ tender crumb and knock-out chocolate flavor (complete with a Hershey’s kiss dropped into the batter of each). Most important, my daughter will know I personalized her birthday cake. The cupcake’s appearance isn’t even a little bit spectacular (though again, the flavor is! ), but as with all of the “playing” I do in the kitchen, things don’t always go as planned. And in the end, my baking (and cooking) projects come from the heart and are great fun. awww, the cupcake looks so cute! thanks, my dear:-) Today I frost the other 77 as the party is tomorrow. Love your site and blog name. Your cakes are AMAZING. Appreciate you stopping by.